Someone alert the Secret Service. Let me tell you how. I am going to say something that I know is true. This story is total bull. I don't believe this for a minute. “Hannity, it's The New York Times .” I have no doubt The New York Times got on-the-record leaks that this is related to Anthony Weiner and Huma Abedin's emails. I have no doubt -- maybe Huma didn't take a sledgehammer to her devices the way Hillary Clinton did. But this is not what resulted in the reopening of this case. No way, shape, manner, or form. Lying to the FBI? I wouldn't recommend it as a career choice. 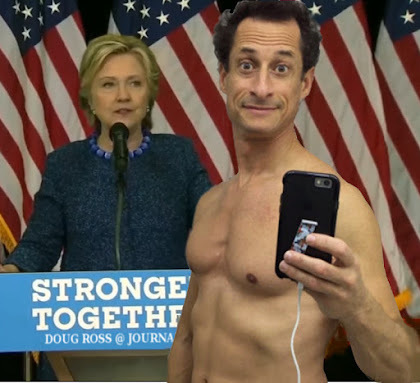 Huma, you feel me? ...new information that the FBI found State Department-related email on her home laptop also calls into question whether Abedin in fact turned over all of the devices she used to send and receive email while working at State. 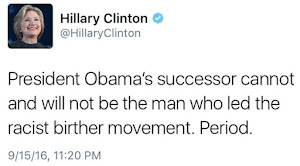 This from a woman who created a private server outside the control of the State Department, didn’t tell anyone about it, had no regards for transparency (nor national security), deleted 33,000 emails when she learned that it was under subpoena in contradiction of the law, obfuscated and delayed all investigations, and did everything to gum up the works. Lied about it. Humorously, the DNC and John Podesta are also calling for transparency from the FBI. They never did for Hillary, of course. 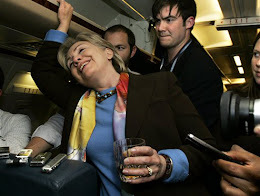 Larwyn's Linx: Hillary’s Quickie Email Press Conference: Vote Early Before This Gets Worse! CARL BERNSTEIN ON FBI REOPENING HILLARY PROBE: They Must Have Found a "Real Bombshell"
Carl Bernstein, of Watergate fame, appeared this evening on CNN to analyze the startling news that the FBI has reopened its investigation into Hillary Clinton. He offered some extremely interesting perspectives into Clinton's reckless and illegal handling of classified information. Well, there's no question that the e-mails have always been the greatest threat to her candidacy for president, that her conduct in regard to the e-mails is really indefensible and if there was going to be more information that came out, it was the one thing, as I said on the air last night, actually that could really perhaps affect this election. A major development just 11 days before the presidential election, the FBI is re-opening its investigation into former Secretary of State Hillary Clinton’s emails. Ann Corcoran’s website has been chosen by the Southern Poverty Law Center as one of the top fifteen anti-Muslim sites. QOTD: "Contrary to Clinton cheerleaders who have amended their initial arguments that the WikiLeaks emails are fabricated, and are now trying to ignore them, the revelations from these leaks are concerning to the integrity of democracy in America. 4 Why won't the GOP help us fix the law we lied to pass? 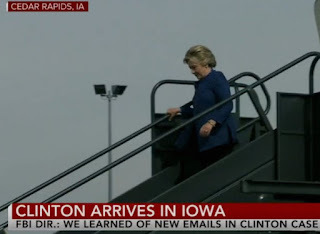 Yes, should this walking RICO violation become president, rest assured that we'll be in the very best of hands. ...and is stunned to discover free-thinking, strong, intelligent and independent Americans. Larwyn's Linx: Cheryl Mills to Podesta: "We Need To Clean This Up...Obama Has Emails From Her"
CLINTON INSIDERS RIP HILLARY'S POLITICAL INEPTITUDE: "Her Instincts Can Be Terrible"
Clinton fixer Cheryl Mills privately admitted that President Obama was lying when he told reporters he discovered Hillary was using a secret email server only when he read it in the newspapers. We also discovered today that Clinton insiders had no respect for or belief in Hillary's political instincts. They certainly hate David Brock, but Hillary's insiders know who to call when they need public relations damage control. In this particular case, the far right periodical Vanity Fair -- which featured a story on Hillary's "body woman" Huma Abedin -- needed to be put in its place. The appropriate illustration for this particular email is the Wicked Witch of the West summoning her flying monkeys. QOTD: "We watched the passage of Obamacare at 1:38am on the day before Christmas Eve in 2009. We watched the Senate, then the House attempt passing Amnesty in 2014. We know exactly how it passed, and we know exactly why it passed. We don’t need to stand around talking about it…. We’re beyond talking. We watch the 2009 $900+ billion Stimulus Bill being spent each year, every year, for seven consecutive years. Omnibus, Porkulous, QE1, QE2, Bailouts, Crony-Capitalism. We know exactly how this works, and we know exactly why this ruse is maintained. We don’t need to stand around talking about it…. We’re beyond talking. Democratic presidential nominee Hillary Clinton vigorously defended the Clinton Foundation’s work at Wednesday night’s final presidential debate. “I’m thrilled to talk about the Clinton Foundation, because it is a world-renowned charity and I am so proud of the work that it does,” Clinton said in a response to a question from moderator Chris Wallace about possible conflicts of interest and impropriety. Wallace’s question came after numerous allegations from Republican nominee Donald Trump that the Clinton Foundation took donations from foreign governments, which influenced Clinton’s decision making while serving as secretary of state. These countries include states accused of human rights violations, economic interests in decisions by Clinton’s Department of State, and countries Clinton has pledged to confront if elected president. LAS VEGAS (October 24, 2016) – Media company CRTV® has announced the formation of a new digital network uniquely rich with honest and informative conservative content seen nowhere else in any medium anywhere. CRTV brings together top thought-provoking personalities Mark Levin, Michelle Malkin and Mark Steyn who will share their knowledge, insightful and powerful ideas, stories and entertainment that cannot be found anywhere on television. Larwyn's Linx: Trump’s Gettysburg Address? He’s Off-Message! Donald Trump expanded his lead over Hillary Clinton in a four-way race to two points, 42%-40%, in day 4 of the IBD/TIPP presidential tracking poll, with Trump moving past his Democratic rival in a head-to-head match-up for the first time. Libertarian Party candidate Gary Johnson fell 1 point to 7%, while Green Party Jill Stein held at 4%. In the first three days of the tracking poll, Trump held a 1-point lead in a four-way race. Unrounded, Trump leads 42.1% to 39.7% – a 2.4-point edge – with Johnson at 7.3% and Stein at 3.6%. THE REAL QUESTION: Will Hillary (and the Democrats) Accept the Results When She Loses? The headlines are in. Trump is the “anti-Democratic” candidate because he refuses to rule out challenging the results of an election that has yet to take place. Such a course of action is “beyond the pale”. It’s a threat to democracy. And it is utterly and thoroughly unacceptable. Except when Democrats do it. Image: Really? Because she's a woman? QOTD: "For the American voter, issues of immense urgency to the survival of the free world -- such as individual freedom, dispassionate enquiry and freedom of speech and thought, which we dangerously have come to take for granted -- are being derailed by crude language and behavior, when Americans need to be paying attention to serious threats to the United States, its allies and to the values of the West. Internationally, these threats come from Iran, Russia, China, North Korea, and countless terrorist groups.